Syllabus of the Online Course (Subject): International Trade and Business in Santa Catarina- Florianopolis - Blumenau (Brazil). 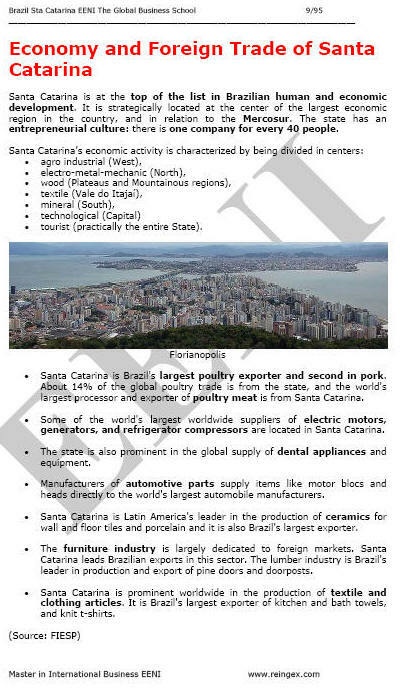 Description of the Online Course: Foreign Trade and Business in Santa Catarina (Brazil). Foreign Trade of Santa Catarina. There are three maritime ports along the Santa Catarina coast: Itajaí, São Francisco do Sul and Imbituba. Blumenau is the largest textile centre in Brazil and an important hub of software. Jaraguá do Sul is one of the main Brazilian industrial hubs (40% of industrial production of Santa Catarina). WEG. As the largest electric motor manufacturer in Latin America and one of the largest in the World. 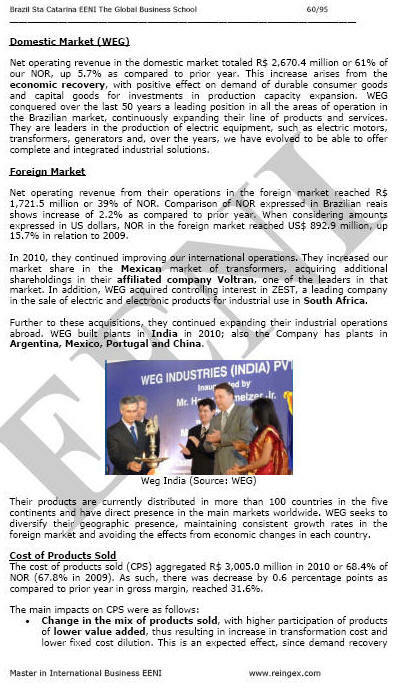 In Brazil WEG, has its main manufacturing units in Jaraguá do Sul, the State of Santa Catarina. “WEG II” in South Jaraguá is considered the largest industrial park in the World. 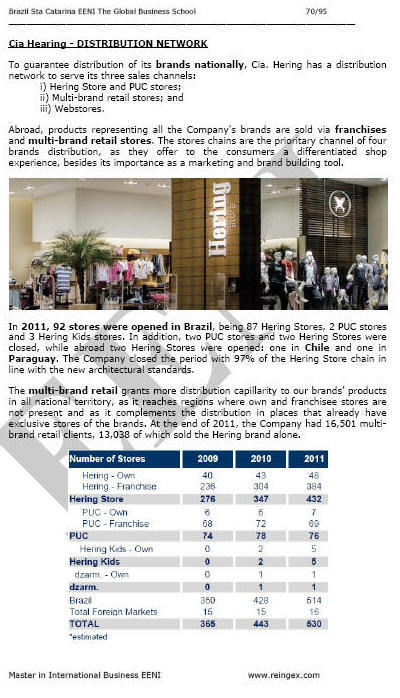 Cia Hering is the largest Brazilian apparel franchise. Hering brand is recognised by 90% of Brazilians in all social classes. Cia. Hering, with main offices in Blumenau, Santa Catarina, and manufacturing units in the States of Santa Catarina, Goiás, and Rio Grande do Norte, was created in 1880 and its key activity is the production and marketing of threads, fabrics, and knitwear, textiles and knitwear, and clothing in general. In 2011, 92 stores were opened in Brazil. Sadia is one of the leading chilled and frozen food producers in the World. 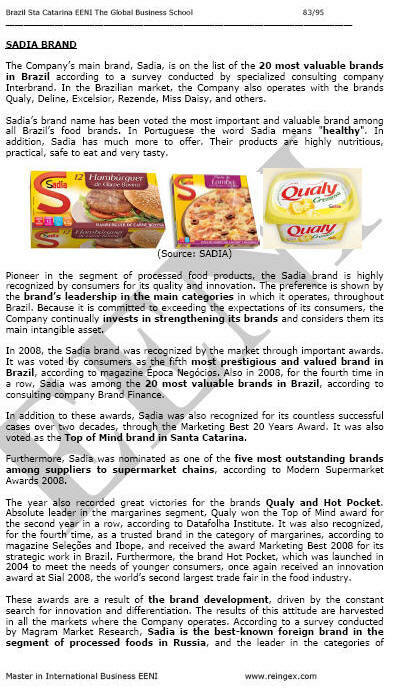 Sadia is the market leader in all segments in which it is present, and it is also the main meat-based product exporter in Brazil. Headquarters are in Concordia in the state of Santa Catarina. Sadia is also one of the largest employers in Brazil, with 60,000 direct employees. Cia Hering is now the largest company of clothing in Brazil. However, his guidance, the focus of its business, always in tune with the trends and requisites of the market, is now very different. Adopting a philosophy advanced enterprise, focused on the exploitation of labour and permanent upgrade of its industrial park, Cia.Hering gone through successive stages of growth, the days of arriving today with brands and prestige products, and a Leadership in its market segment. Working in a segment that is constantly changing, adopted a new position in the market, with the goal of building brands with values decisive to the consumer. In an economy that every day becomes more open and internationalised, the very profile business of the company has changed. Before focusing mainly on the production, the company now employs its greatest energy in the construction and management of three major brands, each targeted to a specific segment of the market. A company the size of Cia Hering, which has its products in all continents, is based on a marketing strategy geared to serve the world market. Cia Hering has become known for its basic line, but now, the focus of the company is intended at products that offer better understanding of placement with the consumer. With the requisite for public increasingly targeted, the company started to have an important efficiency in various market niches. Currently; they are produced near 1,000 items, such as jeans, blouses, bermudas, shirts and intimate pieces, with the labels Hering, PUC and dzarm. Created on May 1994, as a result of the merger and integration of Brastemp, Consul and Semer, companies in the Group Brasmotor, Multibras SA Appliances became the largest industry in the white line in Latin America. Today, is an affiliated company of Whirlpool corporation, the largest appliances worldwide manufacturer, and represents Latin America. Multibras is the only company that manufactures in Brazil, with the marks Brastemp and Consul: refrigerators, freezers horizontal and vertical, stoves, laundry, ovens, microwavesr. With brand Brastemp also offers portable appliances such as coffee and multiprocessor. The company employs today, 6,000 people in their units in São Paulo, Rio Claro, interior of São Paulo; Joinville, in the state of Santa Catarina; Manaus in the state of Amazonas; La Tablada, in Argentina, and Santiago, in Chile. To maximise the use of available resources in Brazil and Argentina to Multibras SA Appliances owns the stock control of the Whirlpool Argentina SA, the market leader in white Argentine, with the brands Whirlpool and Eslabon of Luxury. It has. However, the stock control of the Whirlpool Chile. Since 1995, all units are certified according to the international standard ISO 9000, certifying the quality of its products and services. Furthermore, to the Brazilian market, the Multibras meets the markets of seventy countries in five continents. Founded in 1971, to meet the Brazilian refrigerators industry, so dependent on compressor imports, EMBRACO began producing in 1974 and that same decade became exporter, conquering markets in Latin America, the United States, and Canada. In the eighty their products already arrived on all continents, thanks to a strong sales and distribution structure, currently able to meet seventy countries. Facing Globalisation of the economy the company decided to take production bases abroad and soon came to the world Leadership, which today means a market share of 25%. EMBRACO employs 9,000 people in the World and combines the talent of their professional standing investment in technology. The reliability and efficiency of its products are such that the brand EMBRACO is increasingly the preferred of the largest automakers, the largest appliances and commercial refrigeration equipment producers. Federation of Industries of Santa Catarina State (FIESC). Uniting 130 unions, the Federation of Industries of Santa Catarina State represents the strength of Santa Catarina's industrial sector, which has 33,000 companies and 600,000 workers.